Snowflake | Store and analyze all of an organization’s data in one location. 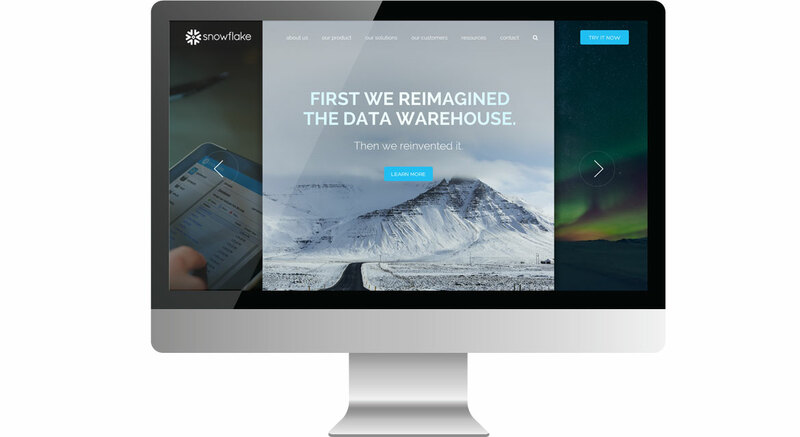 Snowflake is the only data warehouse built for the cloud. Snowflake delivers the performance, concurrency and simplicity needed to store and analyze all of an organization’s data in one location. Snowflake needed to revive their digital brand in preparation for the launch of their self sign-up system, so they turned to dystrick to redesign and relaunch their site via WordPress. 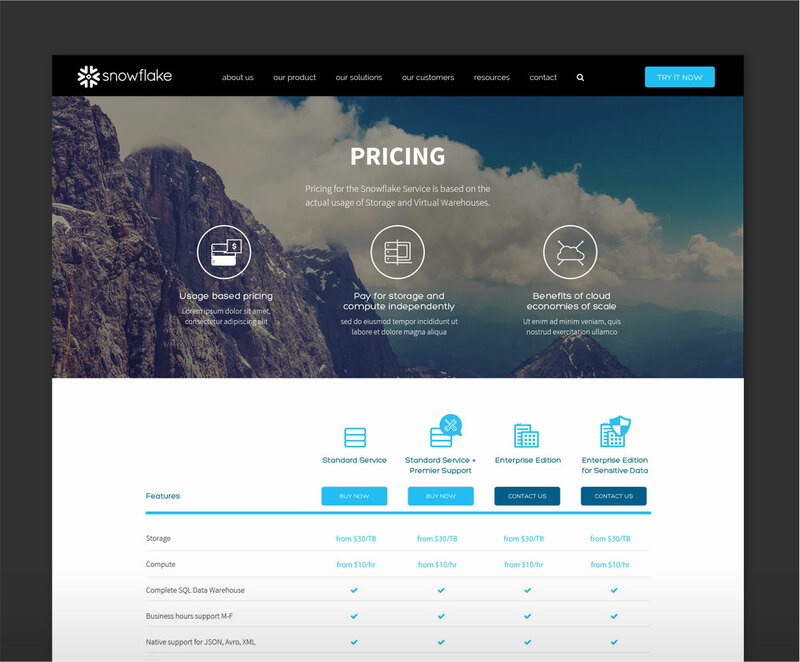 dystrick also assisted the Snowflake team in developing their pricing and self sign-up service. 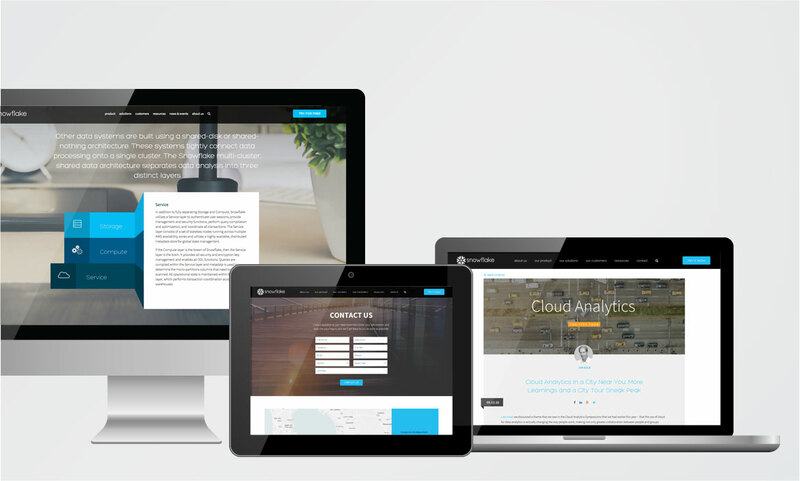 Within a few months time, dystrick relaunched a new Snowflake homepage, along with a handful of other key supporting pages to help get their new digital brand online. Over the next 12 months, dystrick pushed out a handful of new web pages, helped update their Marketo marketing program, and assisted the Snowflake engineering team in building out their self sign-up system, and relaunched their new customer admin portal in ZenDesk. If you’d like more info, please contact us. We introduced a 3-panel marquee design that was modern, unique, and was as functional as beautiful. Each page was hand-crafted with its own unique layout, and was built out responsively for mobile devices to desktops. We were tasked with creating a user-friendly pricing page that was directly connected to the self sign-up system that we also helped engineer. We created custom icons to be used throughout their site and their product.